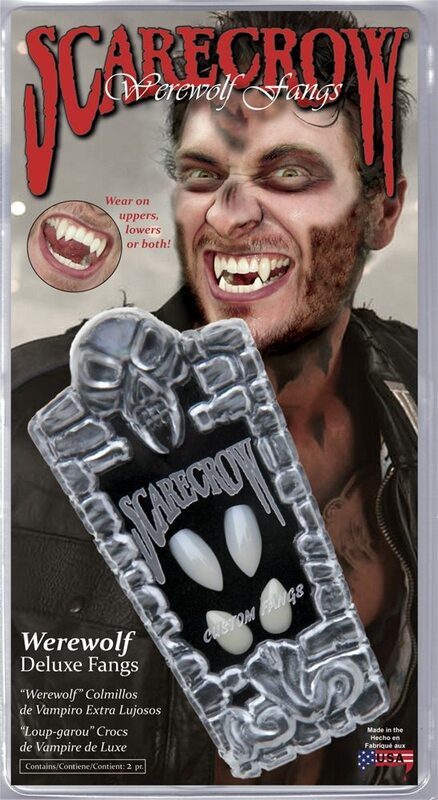 These Werewolf Deluxe Fangs are designed for people with average to larger teeth. They may fit either canines and/or incisors or bottom teeth. These are AWESOME!!! They come with a set of extended saber fangs AND a set of regular custom fangs for the bottom! No boiling water, no complicated and unsightly partial plate to construct and no adhesives necessary to wear these amazing fangs. These fang caps are designed to fit snugly over just a single tooth for the most realistic look possible. They fit great and will last a lifetime, so grab yours now while stocks lasts!